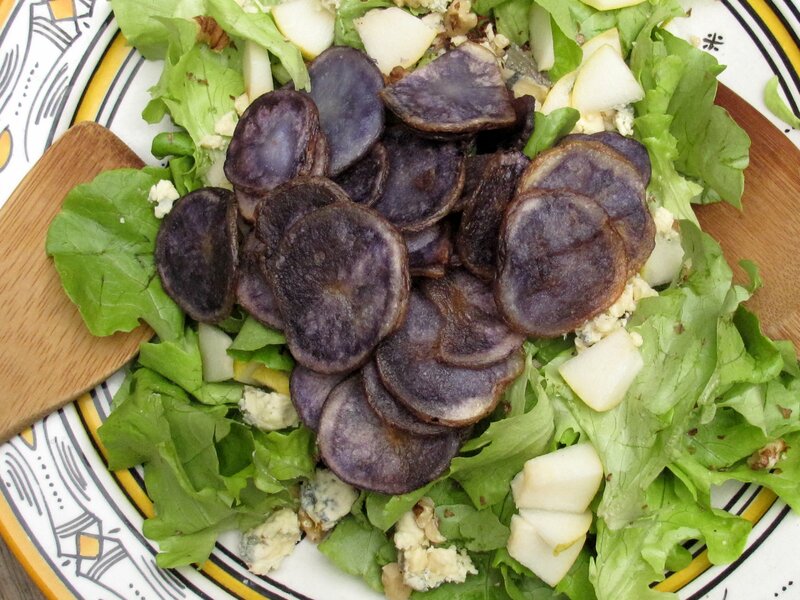 No, you aren’t seeing funny your potatoes really are blue! Well, purple actually. Deep purple. When you cook them they turn blue. I thought that apart from blueberries, blue food didn’t really exist except in Willy Wonka’s world. Turns out it’s very good for you – the blue part is a powerful antioxidant. 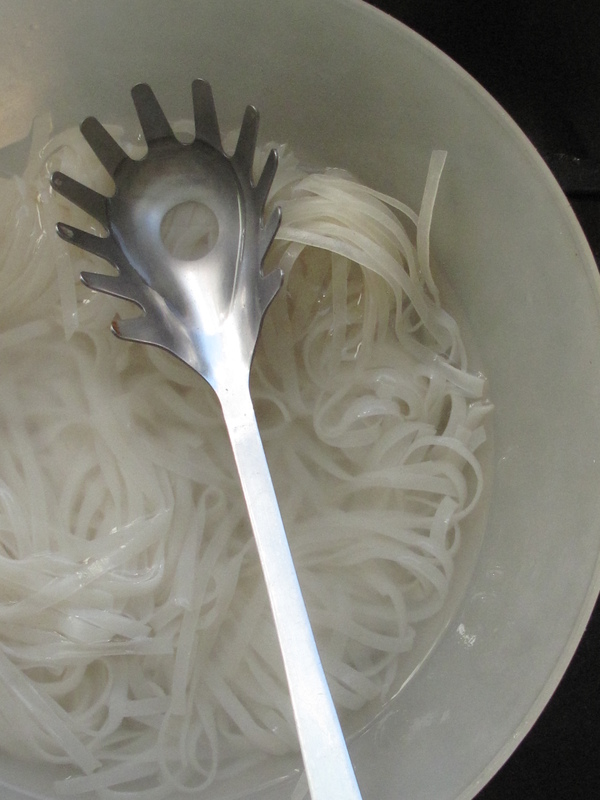 Boiled and mashed – tasty but a lot of the colour leeches out and you’re left with a kind of grey. It’s a Farrow and Ball grey but that doesn’t really help at the dinner table……… To balance things out, I fried up some scallions in butter and stirred them through the mash and topped everything with cheddar and toasted the dish under the grill til golden which improved appearances a lot. Heat the oil for oil for frying the potatoes in a pan then add the potatoes then fry over a medium heat til golden (about ten minutes). While the potatoes are frying, wash and dry the lettuce. 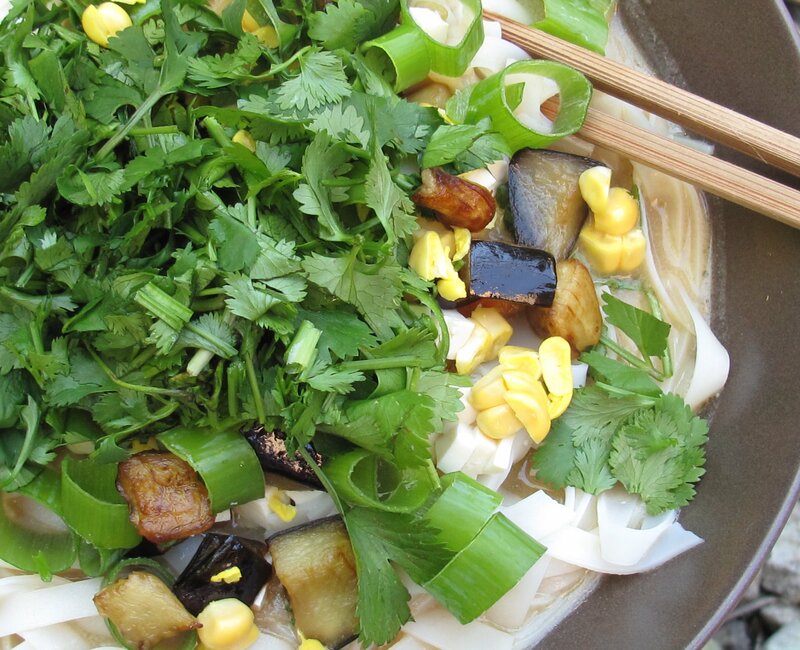 Whisk the dressing ingredients together and set aside. Add the scallions, pear, walnuts and blue cheese to the lettuce. It’s that time when courgette fatigue starts to set in so I got to casting around for something different to fill our bags this week. 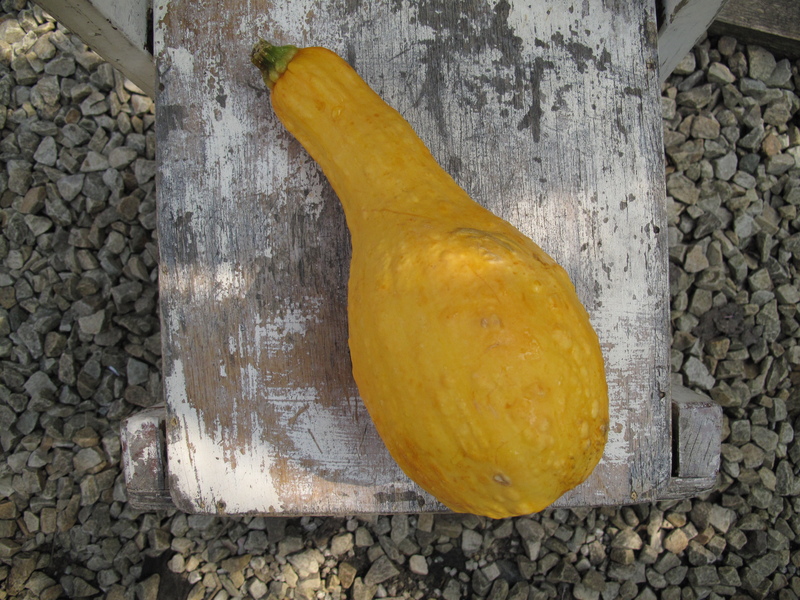 Duncan Healy suggested a squash they’ve been growing which he reckoned were good for stuffing. They’re the Crooksneck variety so they look quite cool. 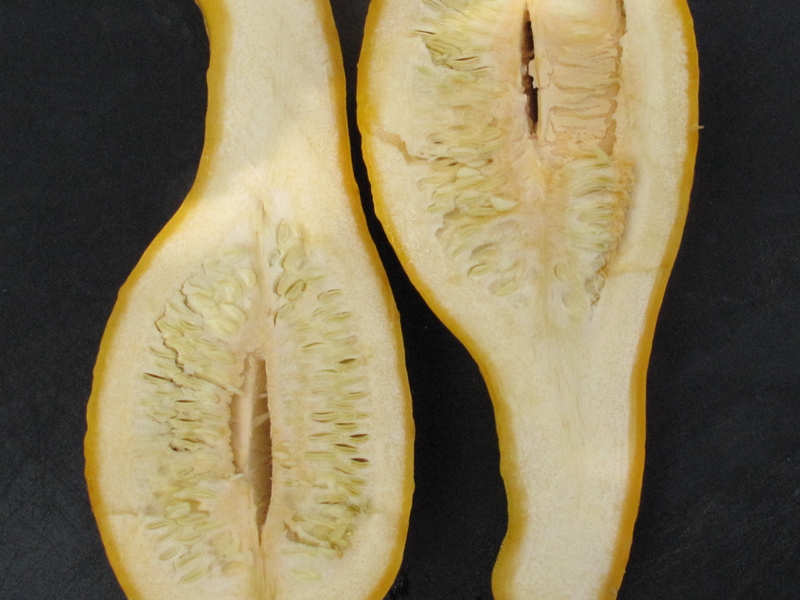 They have a lovely knobbliness on the outside plus the colour, as you can see, is pretty glorious….. As with all squashes you can eat the skin, which is of course packed with fibre, but you’ll need to par-bake without the filling first to get everything cooked to perfection. 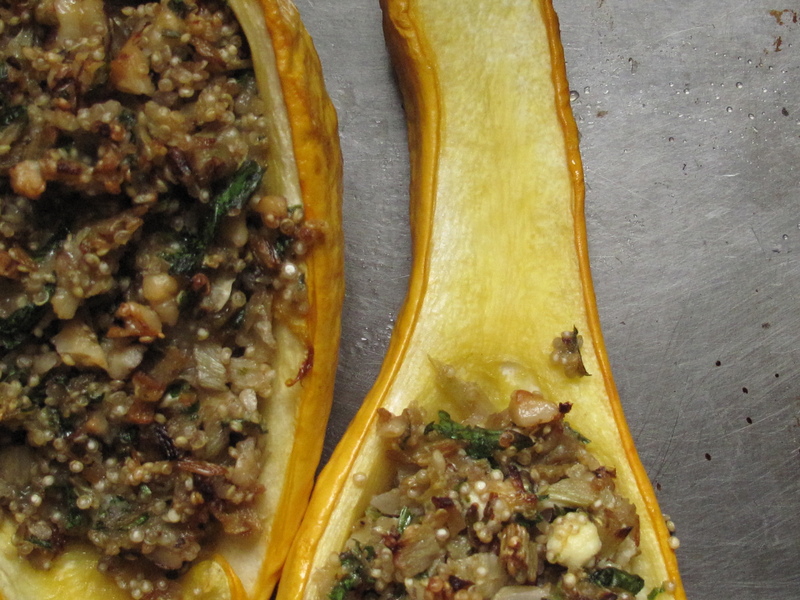 This procedure can be followed for pretty much any variety of squash and the stuffing is a movable feast so if you don’t have quinoa try brown rice or cous cous, instead of fennel a couple of good sized onions would do fine, pumpkin seeds will easily replace the walnuts and the goat’s cheese can be dismissed and replaced with feta. However…….. the combination below does work very nicely and the caramelized fennel leaves the filling lovely and moist and the lemon sounds a light summery note. The quinoa does its fluffy yet crunchy on top thing that I love and the goat’s cheese goes with everything as do the parsley and walnuts. Give it go – you can make it ahead of time as I did again today when I was doing some bread and reheat later, it doesn’t suffer for it. Well ahead of time (at least an hour or two) soak the quinoa in 3 times or more it’s volume of water. This gets rid of any bitterness and also makes it faster to cook and easier for your body to digest. 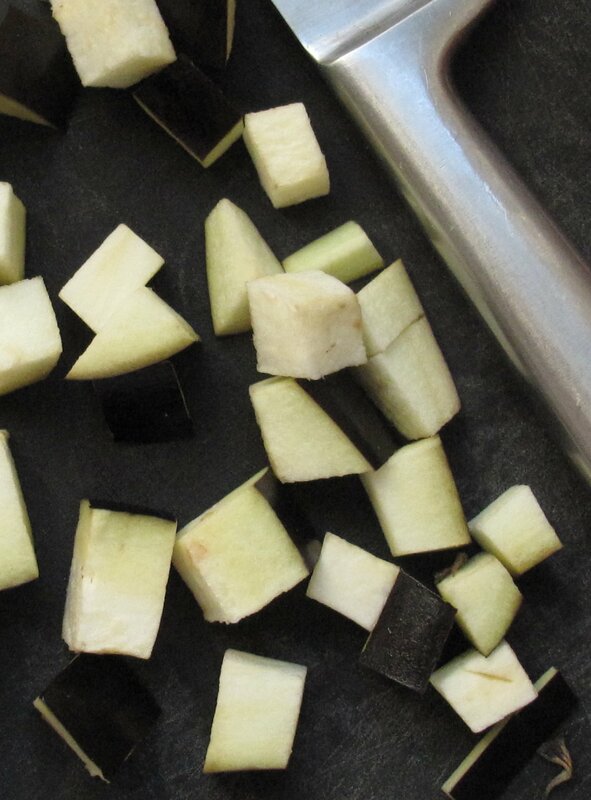 When you’re ready to start cooking, cut the squash in two, slicing length-ways down the side. Using a spoon remove the seeds from the centre leaving a nice dip for you to stuff. Rub each half with oil inside and out then rub the inside with a little salt. Place in a baking tray. Pour in 1/4 inch of water and place in a hot oven (Gas mark 5) for 30 minutes and get on with making your filling. Trim and finely dice your fennel. Heat a generous glug of olive oil in a pan, add the fennel and gently sauté until golden and very tender. While the fennel is cooking, you can prepare the quinoa (if you have any leftovers in the fridge by all means bring them forward – you’ll need about 3/4 cup of the cooked stuff). Drain the quinoa and add 3/4 cup of fresh water and a pinch of salt. Bring to the boil, lower to a simmer and cook gently until all the water has evaporated and the grains are soft and fluffy. This should take about 5 mins. When this is done, take the pot off the heat, stir and set aside to cool. Roughly chop the walnuts and more finely chop the parsley. Add these both to the quinoa. Stir in the fennel. Grate in about half of the lemon rind taking care to avoid the pith. Squeeze in the juice of about half the lemon. Crumble the goat’s cheese and add that to the mix along with plenty of freshly ground black pepper and a little salt. When the squash is ready take it out of the oven and divide the stuffing between the 2 halves. Return to the oven and bake for a further 15 minutes. Can’t find quinoa? We’ve got it and bring it with your veggies next week. 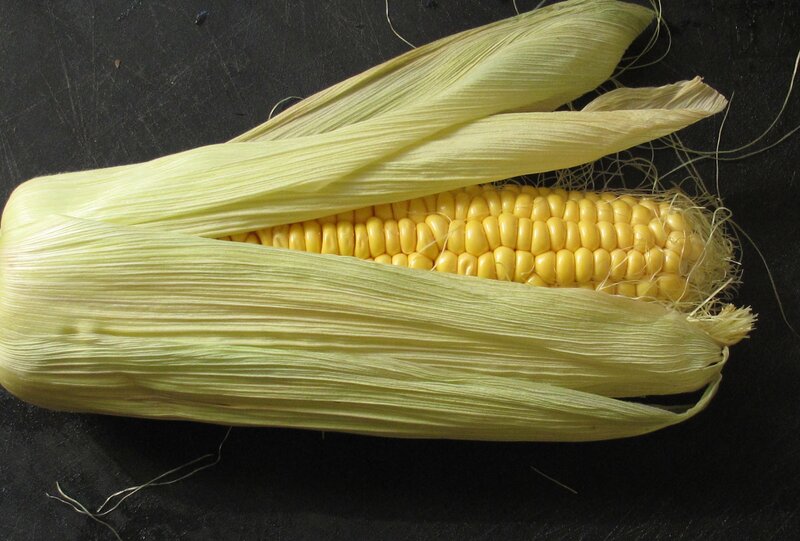 Order here and this wonder grain(more amino acids than you can shake a stick at!) is yours. 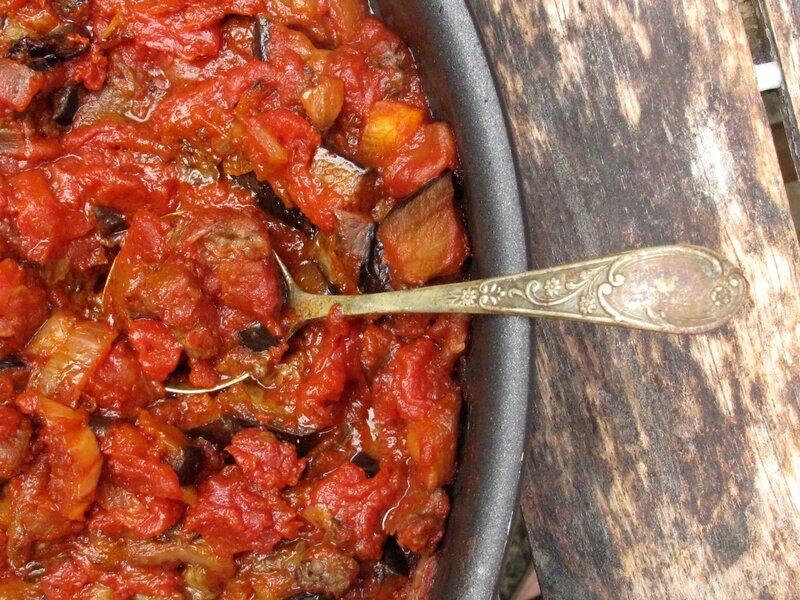 This week’s aubergines make great pastas. The trick is to cook them slowly so they sweeten up nicely and any bitterness dissipates. They end up achingly mellow and tender. 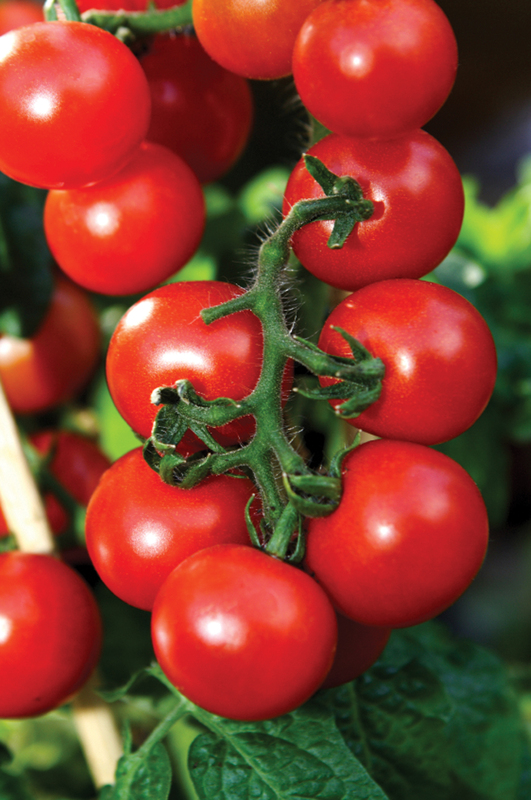 Tomatoes are an obvious cohort and really you can’t go wrong with this combination. 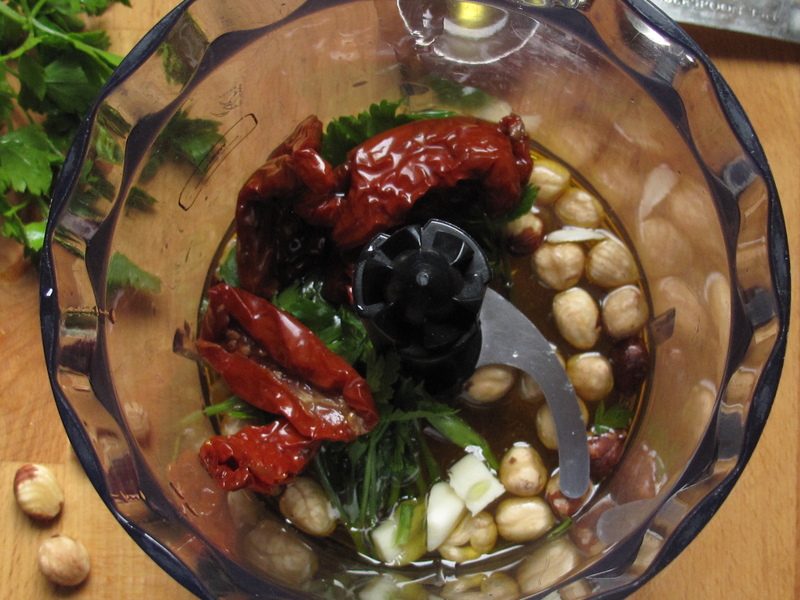 The sauce below takes a little time but it couldn’t be easier and you will be generously rewarded with a super moreish result especially if you track some basil leaves down and scatter over the finish dish for a final heady perfume. Yum yum yum!!!!!!!!!!! I should also say, by the way, that this is stellar with any simple pan-fried fish or meat. Roughly chop your onions and saute over a low heat in plenty of olive oil. Dice the aubergines add to the pan. Toss everything well adding more Olive Oil to stop things sticking. Keep things moving and when the aubergines start to soften and turn a golden brown you can throw in the garlic and a little more Oil if you think it needs it. Allow the garlic to completely soften then add the tomatoes, a generous pinch of sugar (takes away any bitterness that you might get from the tomatoes) and a pinch of salt. Lower the heat a little and cook for another 20 minutes (30 if you’re using 2 tins of tomatoes). Serve with the pasta of your choice and some Parmesan or Pecorino and some torn Basil leaves. 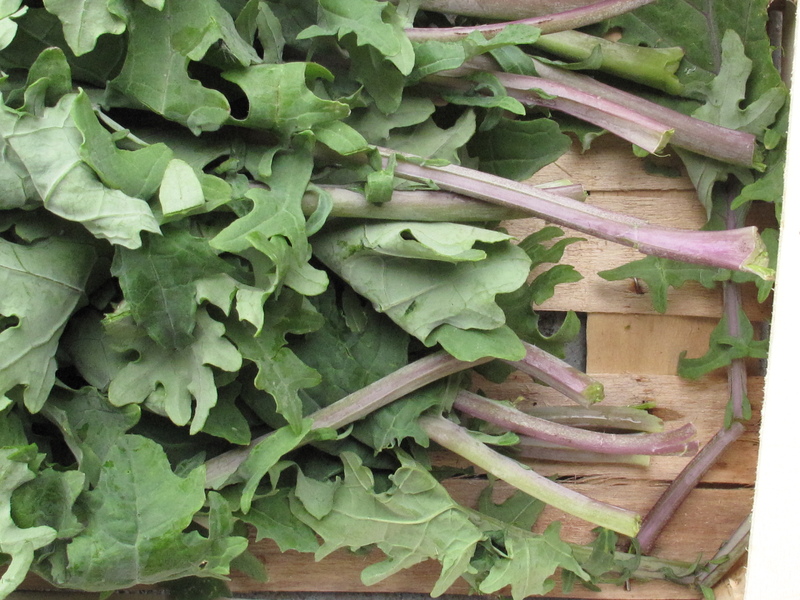 The gorgeous Red Russian Kale in your bags this week was grown for us by Mick Gordan and it’s absolutely packed full of nutrients. Have it steamed, stir-fried (with lots of garlic) or boiled. 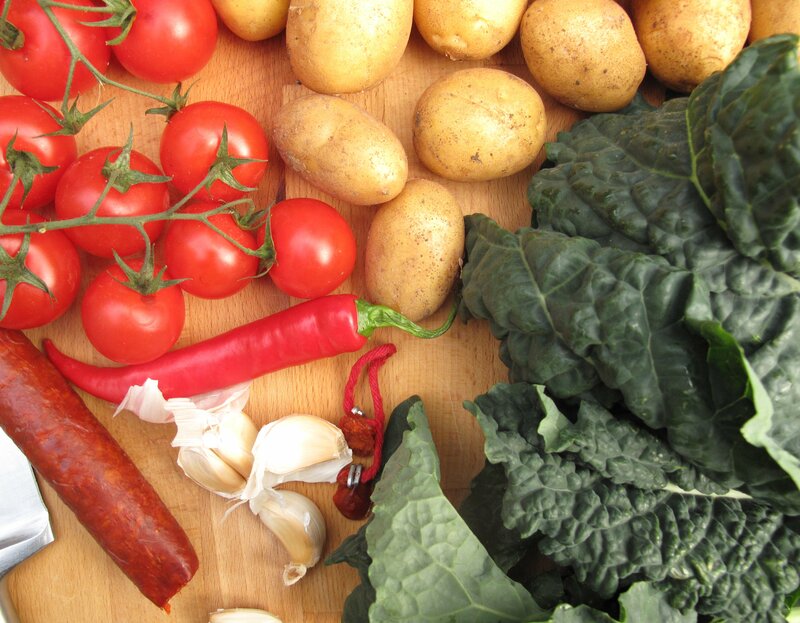 If you want to try something special, chorizo and kale are a match made in heaven and Nigella Lawson’s kale with chorizo topped with a poached egg is the perfect example. It’s lunch, dinner or tea in 10 minutes and it couldn’t be any moreish, a complete treat. 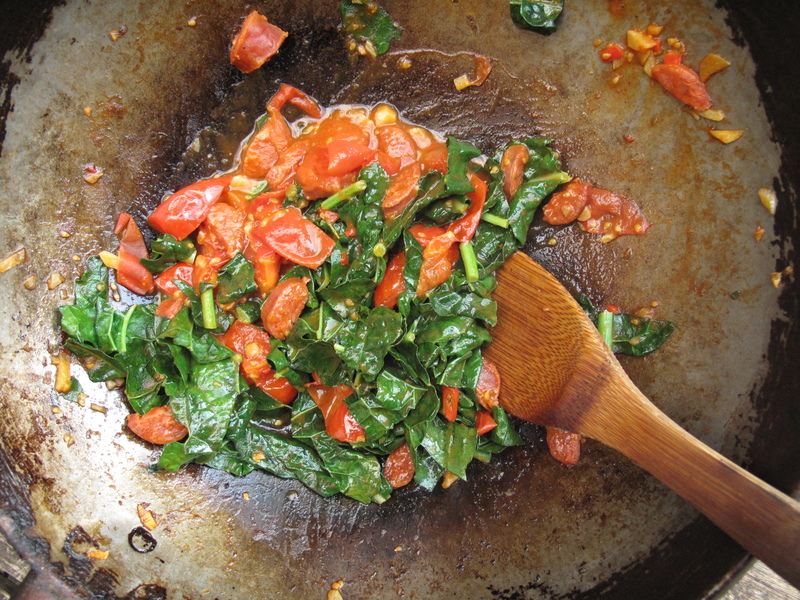 The chorizo secretes its lovely spicy oil when gently fried and this is your sauce.You simply wash and shred your Kale, then slowly fry small slices of Chorizo in a teeny drop of oil for about 5 minutes releasing the oil. Poach an egg, toss the Kale with the chorizo in the pan then serve on a plate topped with the egg (runny yolk of course because adds lovely richness to the dish. Serve it straight up or with crusty bread. In between the showers, this week’s peaches will be perfect on the barbecue – split them in half, barbecue then serve with some mascarpone whipped with cream and spiked with a little vanilla. With the years I find that rather than simply offering me produce more and more suppliers ask me what I want them to grow. What joy! The list is long and, and given our inclement climate, a little aspirational. Every year we try different things with varying degrees of success and slowly but surely the range of Irish organic varieties expands. Kale is generally not a problem (although for some reason there was a national shortage this spring) but the coarse curly stuff has always left me non-plussed. It’s healthy. Sure. Actually it’s fantastically healthy – more antioxidants than you can shake a stick at. But it needs work to compensate for all that chewiness. I prefer its altogether more sophisticated (and just as healthy) cousin the Black Tuscan variety and our suppliers have been trying it out. Up first this year is Oliver Kelly’s. It doesn’t disappoint. If you want to keep things simple toss it on the pan with some garlic and you’ve got a tasty side. Or, start with a couple of hunks of chorizo and top with a poached egg for the ultimate moreish yet pretty healthy supper. It can also be juiced but be warned – this is not for the faint hearted (although you can practically feel yourself getting younger as you drink it!). This week’s recipe offers no such challenge -super- tasty and comforting it’s also easy peasy. 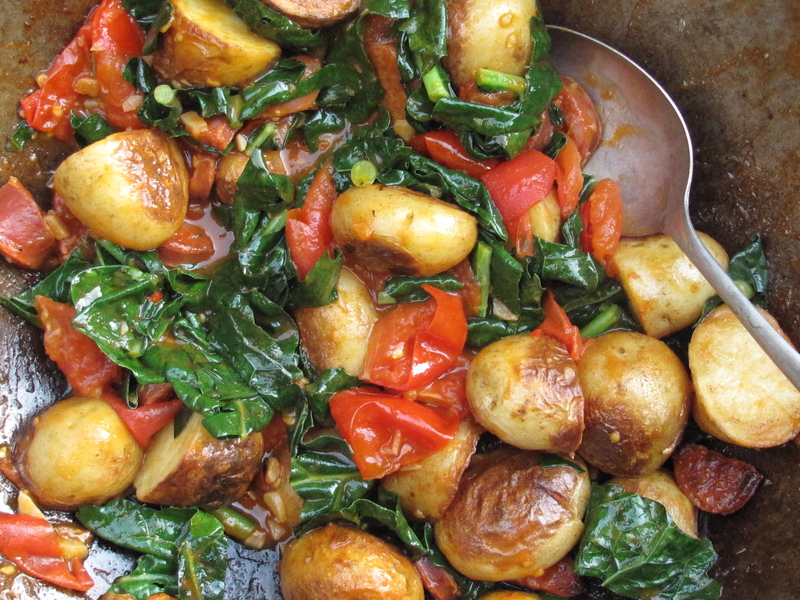 Sautéed new potatoes tossed with a fiery mix of chorizo and sun-ripened tomatoes (it being summer and all) and wilted kale. It’s a dish that wouldn’t turn it’s nose up at a sprinkling of feta or a dollop of creme fraiche. You gotta balance out the juicing, right? Scrub the potatoes and cut them into large bite-size pieces. Bring to the boil then simmer til tender then drain. Heat some olive oil in a pan. Add the potatoes and saute over a medium heat til golden. While the the potatoes are frying, heat a little olive oil in another pan. Add the garlic, toss for a minute then throw in the chorizo. After another couple of minute add the tomatoes and a pinch of Maldon. Toss everything over a brisk heat until the tomatoes have collapsed. Turn down the heat a little and let everything simmer for 2-3 minutes then turn the heat back up and throw in the kale. Allow the kale to wilt then turn off the heat. At this stage the spuds should be done. Let these rest on some kitchen paper for a moment before mixing them with the tomatoes and kale. As I said a sprinkle of feta or a drizzle of creme fraiche or sour cream would be nice before you serve. Enjoy!!! We are well into asparagus season so I thought I’d share our favorite recipe this year as so many of you got asparagus this week. Like most of finer things in life simplicity is the way forward (I know I say this a lot but it is!!!). A simple steaming, followed by a drizzle of olive oil or some butter, crushed Maldon…………… yum! Chop up your spears and toss them with pasta and Parmesan and a squirt of lemon for the ultimate in Italian refinement. Have them for breakfast week with eggs…….all they need is a creamy foil to really come alive. I have a taste for the charred which I got years ago from a chef I worked with in Barcelona and I often cook my asparagus this way. Use a griddle pan getting it nice and hot. Add the asparagus turning them when they char. This takes a minute or two depending how hot the pan is. When you have your snazzy stripes, add a little oil and some crushed Maldon salt and shake the pan vigorously. Turn down the heat a bit and cover for a minute and allow the asparagus to steam a little and cook a bit more which should get them nicely al dente. After this, drizzle a little extra virgin olive oil and a spritz of lemon juice on them then some shavings of a nice hard cheese. Parmesan or Pecorino are obvious choices but a nicely matured Manchego also works really well. You don’t need loads just a little bit to add interest. As is it’s a picky starter to have while dinner is coming. This week’s recipe is what you do when you’ve got more people around and/or you want a proper starter. 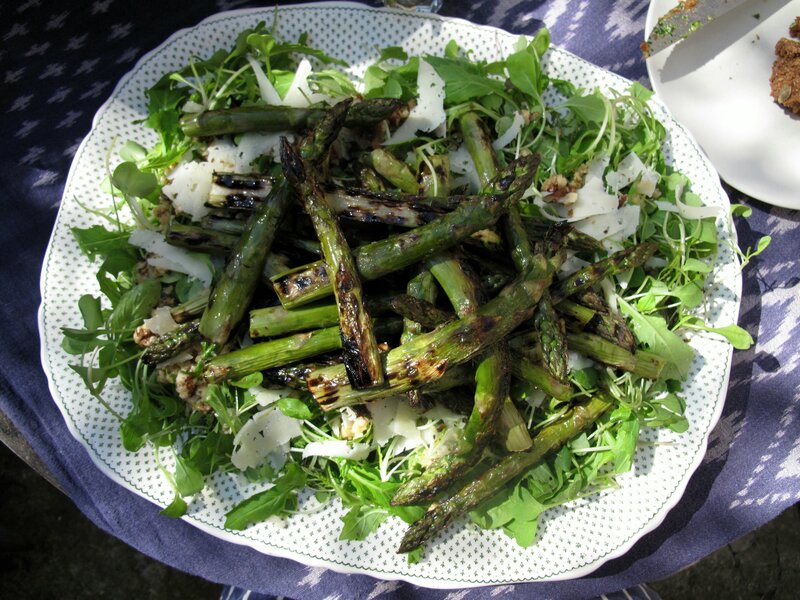 Serve the asparagus on a bed of Marc Michel’s amazing mixed leaves and add chopped walnuts and honey to the dressing. Simple but really gorgeous and well worth doing to showcase one of summer’s most popular varieties…………. 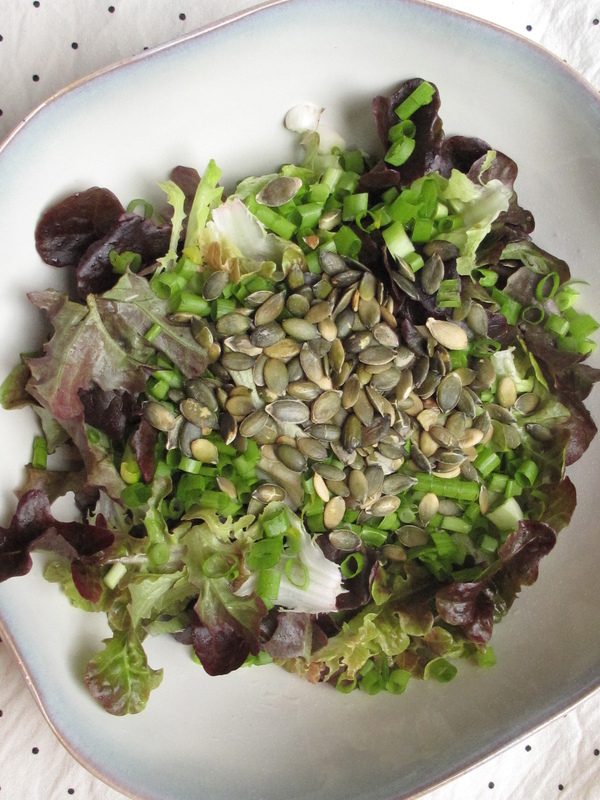 100gr mixed leaves – washed, dried and ready to go. Chop half the walnuts quite finely and the other half into small pieces and set aside for later. Trim the tough ends of the asparagus – usually about an inch is more than enough. Heat a griddle pan. Add the asparagus and griddle until stripes appear then turn over and griddle on the other side. When both sides are done, add a little olive oil and a crushed Maldon to the pan and toss over the heat for a minute before turning down the heat and covering. 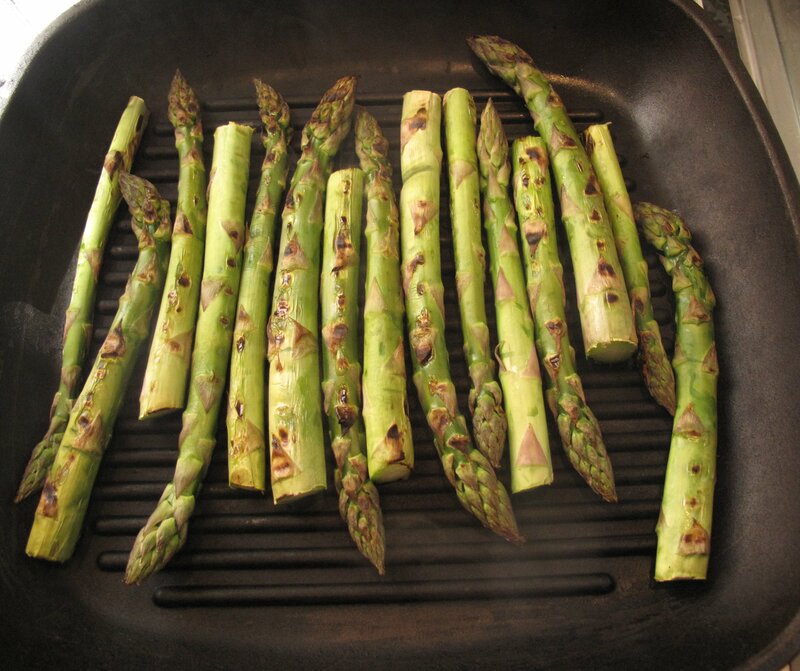 Allow the asparagus to cook for another 2 minutes before removing them from the heat. 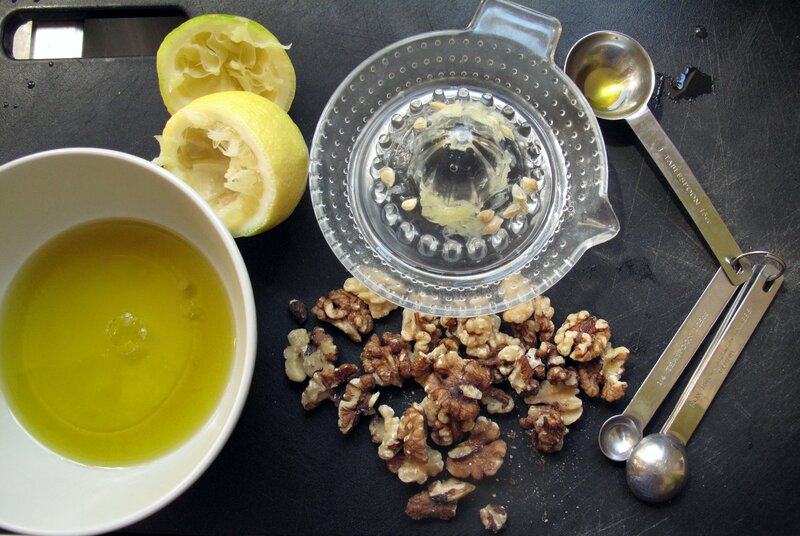 Make the dressing by whisking the olive oil with the lemon juice, honey and the more finely chopped nuts and a pinch of crushed Maldon. 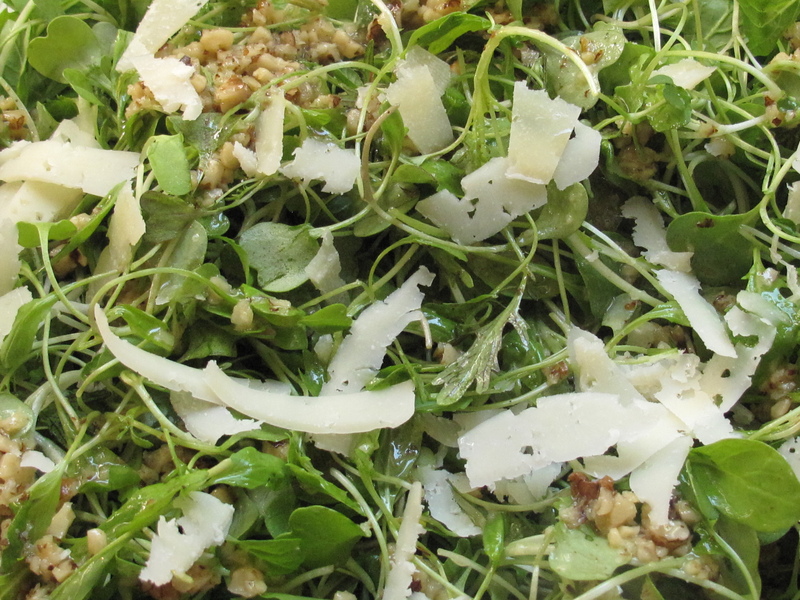 Lay the asparagus on the salad leaves and scatter the shaving of cheese on top. 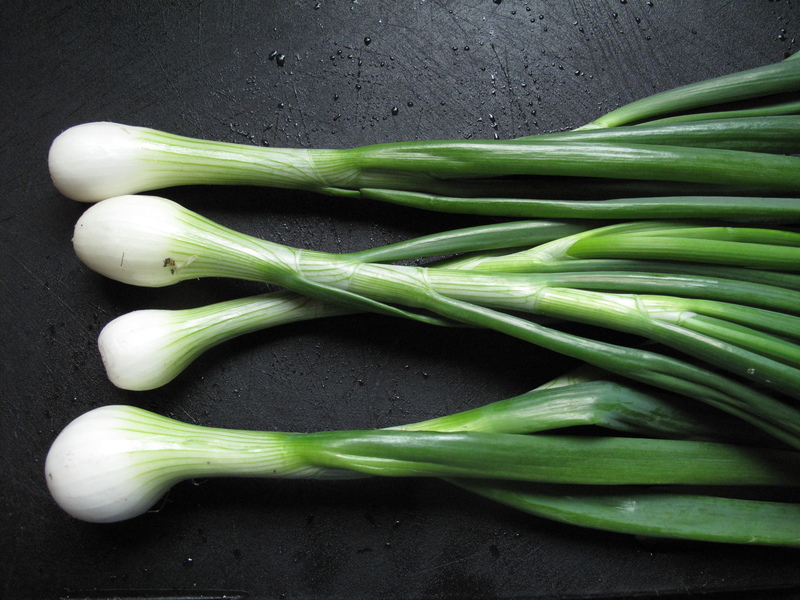 This week we have more of Mick Gordon’s brilliant spring onions. In our house they’ve been working their way into pretty much everything we eat for the past few weeks – buckwheat noodles with tofu, coriander and peanuts for lunch yesterday. Another noodle salad with prawns, tons of (Mick’s) spinach, coriander and a ponzu. rice wine vinegar and honey dressing a few nights earlier (no soy as we’d run out which I thought would be disaster but it turned out to be a blessing as it made everything fantastically fresh and summery). Then today’s lunch of avocado with Marc Michel’s lovely lettuce, some leftover fish and yet another impromptu ponzu, honey dressing. All I can say is, play around, don’t waste anything. Every bit can be used. Chop the green bits into any salad or use as a garnish (remember the darker the colour the better it is for you) and the whites can be thrown into salads or minced into dressings. It goes without saying that a quiche or tart with these guys would be amazing. If you can’t bear the thought of dealing with pastry (or maybe I’m projecting) a fritatta is a good compromise as I suggested last week. Gruyere, goat’s cheese or a good cheddar are all good partners here…….. There are other ways to go……… our recent arctic temperatures had me looking for ways to get the oven on so I decided to roast up the onions and serve them with a sun-dried tomato and roasted hazelnut pesto. Yummmmmmmmmm! The pesto is beyond moreish and a cinch to make. Make a double quantity and keep in the fridge for sambos and dips. We brought a tub to Africa day yesterday and it kept everyone big and small happy. After about 30 minutes in a hot oven the onions wilt to a soft, sweet luscious mess which is offset beautifully by the slightly spikey pesto. 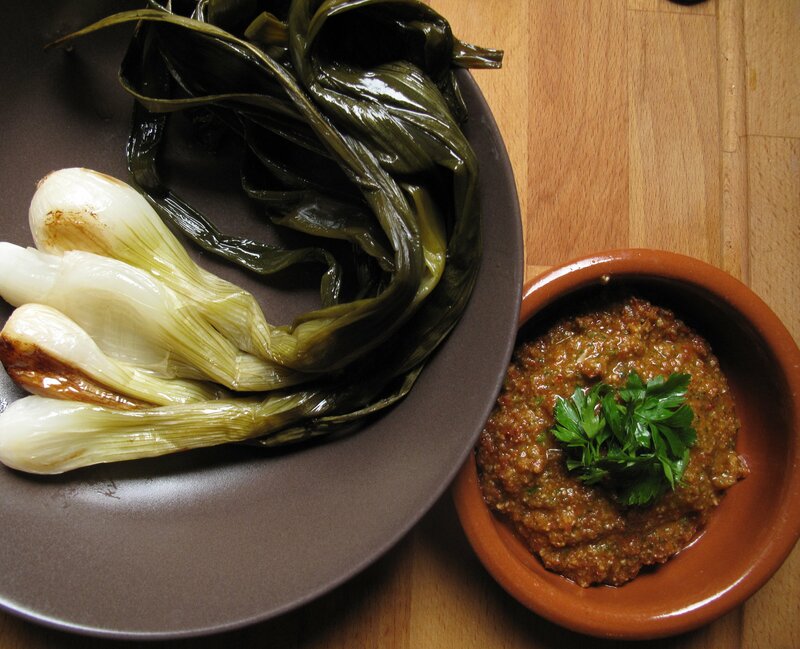 Serve with bread or wedges of polenta. Add some goat’s cheese and a green salad and you’ve got lunch or a light supper for two sorted. Give the onions a clean then put on a baking tray, cover, drizzle with olive oil and place in a hot oven to roast for half an hour. When the onions are ready, serve alongside the pesto with plenty of napkins for all the drips!